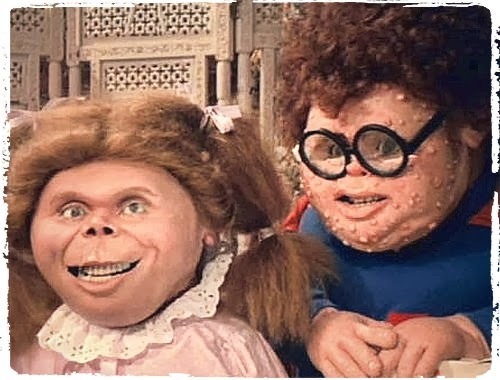 The Garbage Pail Kids Movie starts as local hard-man and bully Juice (Ron MacLachlan) and his muscle Wally (J.P. Amateau) and Blythe (Majory Graue) finds his pretty girlfriend Tangerine (Katie Barberi) at Captain Manzini's Antique Shop where she is talking to fourteen year old boy Dodger (Mackenzie Astin), Juice becomes jealous and angry and beats Dodger up leaving in a nearby sewer covered in sewage. During the fight in the shop an old garbage pail was knocked over which green slime oozes out of, then seven disgusting ugly looking kids emerge ranging from Greaser Greg to Valerie Vomit. Co-written and directed by Rod Amateau this notorious film is based on the Topps Chewing Gum card series The Garbage Pail Kids which were at their most popular back in the mid 80's and were a big craze back then, I myself collected them as a kid and still have several hundred original cards from the first eight series that were released. 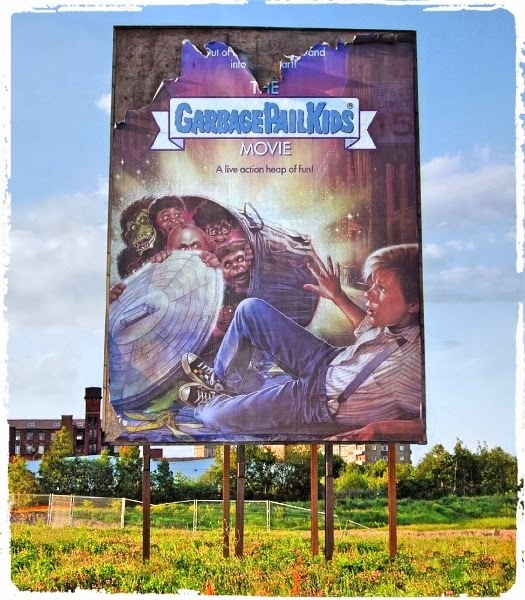 I can't say I remembered much from the film but there were a few scenes here and there that seemed familiar, anyway The Garbage Pail Kids is generally considered one of the worst films ever made amongst regular movie goers but as a bad film I found it somewhat enjoyable despite being terrible. The film lasts for 96 minutes and despite being pretty awful in every conceivable way I had great fun with it and I certainly wasn't bored, the script is a mess that is so uneven and misjudged it's difficult to understand. 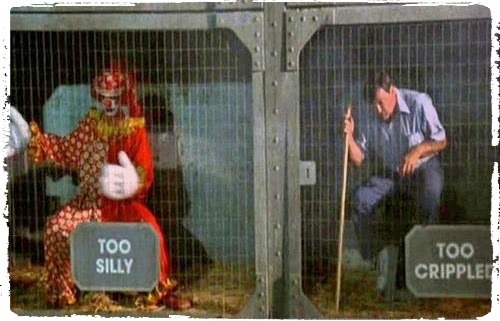 Some of the jokes and gags are tasteless and bordering on perverted. From Messy Tessy and her snot problem to Windy Winston who farts loudly all the time to Ali Gator who just wants to eat people toes these kids lack basic social manners. There are some uncomfortable moments as well, like the fourteen year old Dodger getting excited when Tangerine changes shirts or when he has a bath and someone notes that he has 'nice legs' (this is a fourteen year old boy!) in a suggestive manner, Dodger is beaten up and mugged in broad daylight yet no-one helps him and the bizarre concept of the state home for the ugly which is played in creepy and sinister seriousness is just wrong. The whole film is wrong, the story is all over the place with a strange mortality tale at its heart that seems to be building up to a feel good happy ending but doesn't particularly end well for anyone as the bullies are beaten, Tangerine is exposed, Dodger is left heartbroken and the garbage pail kids ride off into the distance to cause more havoc after their friends are killed back at the state home for the ugly. The Garbage Pail Kids Movie really has to be seen to be believed, there's even a musical number about halfway through as the kids break out into song. There's a bit of gore as Ali Gator eats eyeballs and severed toes, some very tasteless moments like Windy Windston ripping some loud farts and Valerie Vomit finally projectile vomiting green sick over a couple of people. But then again without these moments this would have been as boring as they come. 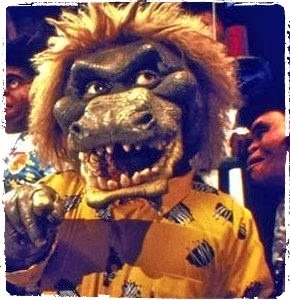 The special effects vary, the kids are really odd looking, and they just look sort of weird and creepy and freaky. They are sort of cartoon monstrosities brought into the real world; they have little movement as far as facial features go which gives them a strange stiffness. They all look quite rubbery and surreal yet I ended up quite liking them. Despite being cast as great fashion designers the clothes on show are awful and where did the names of these people come from? Who exactly calls someone Tangerine? The whole film is very 80's and for that I am not complaining. The opening sequence is bizarre and features a spaceship shaped like a garbage pail that wobbles all over the place like one of the strings holding it up has broken! Totally random and has nothing to do with the rest of the film. 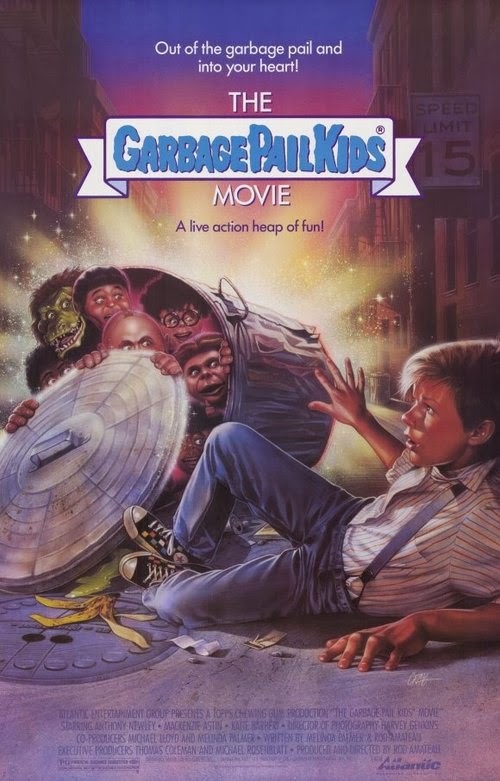 With a lifetime gross of just over $1,500,000 this was a huge flop (although it was barely released) so the news that a new Garbage Pail Kids Movie is to be made seems a gamble but it's one I'd like to see considering the advances in technology and special effects. The whole film looks cheap and very dated but that's part of its charm I think. The acting is poor but in an entertainingly bad way, not just stiff and wooden but over the top and hammy. 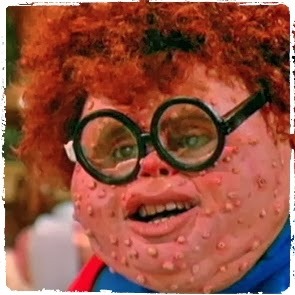 The Garbage Pail Kids Movie is a film with a really bad reputation but I have to fly in the face of popular opinion here and say I enjoyed it for what it is, the original cards were brilliant and imaginative and funny and disgusting and gross and wonderfully painted while the film is just surreal and wrong but I liked it none the less. Apparently there were plans for a sequel but it was never made. Giving Thanks: Let Us Thank The Comedy God’s For The SNL Movies That Never Happened. This Week's Hot Ticket: Diora Baird! I Run Sh*t Here! You Just Read Here!. Picture Window theme. Powered by Blogger.